Everybody loves unicorns! OK maybe not everybody but if you are one that does – this book has an interesting and fun story for teens and older readers plus tons of illustrations to feast your eyes on. It’s the tale of a little unicorn who is born into a tribe of magical metal horned unicorns. The poor little thing feels like an outcast because he just doesn’t fit in with the rest of them. The story is about his journey to meet his destiny to save the tribe from extinction even though he is not magical and his horn is not like the others. This is a fun adventure story for with lots of pics. I came up with the idea for a tribe of metal horned unicorns 30 something years ago. I was interested in unicorns and the properties of different metals. What did you get when they burned? Beneficial products or medicines. What kind of magical attributes might come from different metal properties? There were no metal horned unicorns at the time so I started building my unicorn world. All of the characters have metal horns except for one. He is the plain blue unicorn. Everyone knows that if you don't have a metal horn you have no magic. The problem was he was the only one who could save the tribe! Could he do it? Maybe, with the help of the brass horned unicorn whose horn is bell shaped like the flared end of a trumpet and Dr. Zinko, the magical medical unicorn and all the other magical unicorns. “Sure Blue sighed,” lowering his head sadly. “The tribe is all together except for me. What is wrong with me? Why didn’t I just get out from under these bushes and join them? Why do I feel like I don’t belong? Oh yeah…no metal, no magic. That’s why." He sulked quietly, twitching his tail slowly back and forth, completely oblivious to the tiny insect on the ground. “How rrr-ru-uuuu-de,” the angry buzzy-biter cried in disbelief. He could not believe he had been batted to the ground after having mercy on the unicorn. The big beast’s hostile act was quite unexpected. It had invaded his home territory and now appeared to be initiating war. Blue turned his head to see that the angry critter was back. He seemed to be raging at him again but all he heard was, "B-u-z-z-z-z-y b-i-t-e-r, b-u-z-z-z-z-y b-i-t-e-r!" "Oh no!" Blue panicked upon hearing that war-cry sound. He turned his head to see the bug was making a bee-line for his backside. He flung his tail frantically back and forth across his unprotected rump. More hairs clung to the sticky jughead nectar with every swipe. 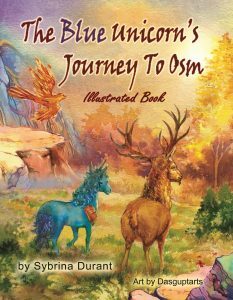 Still, all Blue heard was "Buzzy-biter-buzzy-biter-buzzy-biter," as the insect’s gaze zeroed in on the center point of two long blue hairs glued to the unicorn’s rear-end. X marked the buzzy-biter’s spot. Blue uttered a quiet “yeow” when he felt the needle’s sting. It was all he could do to choke back a loud yelp. Despite the painful sting, the thought of drawing Cornum’s attention was enough to stop Blue from crying out. The pain was quickly becoming unbearable. Blue twisted his head around to see that the buzzy-biter was still attached to his flesh. Its barbed stinger had penetrated all the way through his hide. Its hook was sticking out the other side. “I’m stuck. I’m stuck. I’m stuck,” the buzzy-biter yelped. That was not supposed to happen. “I must break free!” the buzzy-biter screamed. Its wings batted violently against the air as it tried to escape, but the link between the hook and its body acted like a powerful spring. The bug’s body snapped back viciously against Blue’s rump, injecting even more venom into the unicorn. On the fifth try, the buzzy-biter finally broke free but its hook-shaped stinger stayed behind.